Katie grew up in Calgary with a passion for the outdoors, functional movement and community. She combined a bachelor’s degree in Social Work and a Master’s degree in Physiotherapy in order to provide care with a truly biopsychosocial approach. 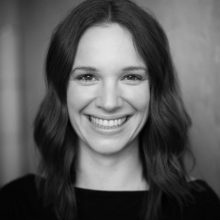 Katie has worked in a variety of settings including hospital, private practice and the Canmore Pain Clinic. She uses many different treatment modalities with clients including acupuncture, manual therapy, therapeutic yoga and mindfulness. Katie has continued to study with post-graduate work in the fields of women’s health, manual therapy, persistent pain and yoga. Katie is passionate about engaging clients in their journey to health with an evidence-based and client-centered approach. She is thrilled to use principles of neuroplasticity to change the brain, help clients regain function and move with ease, integrity & joy. Katie is the course developer and instructor of Transforming Pain with Neuroplasticity. This outstanding course provides therapist with alternatives to help clients who live with persistent, chronic pain. The vast information and resources provided are equally valuable for participants to utilize within their own self care routine.